In 2008, I decided to travel to Europe. I'd never been, and I was just about to make a big change in my career, so the opportunity might not present itself for a while. Thanksgiving fell near the end of my trip, when I was beginning to feel homesick. While eating Moussaka on a patio in Santorini, I missed my family dearly; it was my first Thanksgiving away from home. I pictured the scene at my aunt and uncle's: the turkey on the table, the boys playing video games, my dad and Uncle Danny politely debating politics, the way they do every year. I was completely taking for granted the fact that I was having Thanksgiving in freakin' Greece! The other day, I saw an Internet eCard that said our brain spends 70 percent of its time either thinking about the past or daydreaming about something that hasn't happened. While I don't know if that's based on anything remotely scientific, it makes a good point — we spend way too much time not enjoying where we are now, at this moment. I'm incredibly guilty of this, and I think frugal people often are. We're always planning, saving and working toward something. We're prepared for the future, and we value our past mistakes. It's a great mind-set to have, but that same mind-set often keeps me from enjoying the present. For example, earlier this year, I got a significant raise. Immediately upon receiving this news, I thought, “OK, what do I need? How much should I put into my emergency fund, and how much should I spend on things that I want?” Whether it was saving or spending, my reaction wasn't a sense of contentment with the fact that I was now better able to sustain the life I have; rather, it was a question of how could I improve my life. I'm obsessed with constantly improving, which I don't necessarily think is a bad thing, but sometimes it keeps me from realizing that great things are happening now — like having lunch in Greece. Like most frugal people, I'm anti-instant gratification. You're here, reading Get Rich Slowly, so I'm sure you can relate. I learned about instant gratification at a young age; my parents were very much against it, and they taught me that it's not an option. As an adult, even if I have the money to buy something I really want, I feel guilty if I don't scrimp, save and wait to buy it. I have an aversion to instant gratification. But it seems like I've gone to the other extreme — I often deprive myself of the things I want for no other reason than to deprive myself. I feel as though I need to pay my dues when the dues are often non-existent. My computer, for example, is on its last leg. I have enough money to buy a new one, and a new one would make my day-to-day a lot easier (it's already crashed twice this morning). But I've been putting it off, and it's only because I can't imagine the thought of plopping down several hundred bucks without any sort of sacrifice or restraint. I suppose it comes from a good, frugal-minded place, but it's silly. I should just buy the darn thing and be thankful that I'm in a position to buy a new computer when I need one. But my aversion to instant gratification keeps me from making my life right now easier. Whether it's about paying off debt or saving for retirement, money often seems to be a way to gauge the future. My life milestones are almost not measured in years but in how much I have in my savings account. 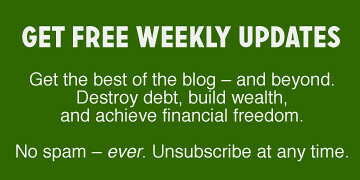 For example, I recently used my money-tracking program to set up a retirement goal. It asked me at what age I want to retire. Sixty-five, I decided. It then asked me how much I'd like to save each month. I put in that amount, and — lo and behold — it looks like I won't be retiring until 80. My life goals are determined by money, not time; my plans are determined by how much I have saved. But that's just the way it goes. So it's only natural that those of us interested in making the most of our money are obsessed with the future. And again, that's not a bad thing — you have to plan! But my to-do list essentially runs my life. My mind is constantly thinking in terms of this list. But lately, I've been asking myself: If I'm constantly planning for the future, how often am I appreciating the present? I've been juggling these thoughts for the past couple of weeks, contemplating what I would write about for Thanksgiving. Also within the past couple of weeks, I made plans to fly back to Texas to join my family for the holiday. My boyfriend and I will be separated for Thanksgiving, but I planned to return on Friday and join his family for the rest of the holiday weekend here in Los Angeles. Well, long story short, a change of plans meant they would be spending the holiday in a different city. My boyfriend asked if I could change my return flight; unfortunately, that meant a costly fee from the airline. After deliberating over the stupid fee and receiving some warm convincing from his family, I decided to just bite the bullet and pay it. I hate paying fees. And I'd been stewing over it for the past few days, when, outlining this article, I remembered — I should be thankful for what I have right now. I'm lucky to have two families to spend Thanksgiving with. Sure, that fee threw off my budget a bit, but the decision has been made. If I'm still stewing on it, then I'm getting gouged on more than just an airline fee. The more time I spend stewing, the less time I spend enjoying my favorite season and my favorite holiday. So I've decided I'm letting it go. The definition of frugality says it's about avoiding waste, and I can't think of anything more wasteful than stewing over the past. By the time this gets posted, I'll likely be doing one of a number of things: laughing with my brother, making pumpkin pie with my parents, or having a glass of wine with my boyfriend and his lovely family. Whatever it is I'm doing, I'll be making an extra effort to enjoy, savor and truly be thankful for the moment. There are 18 reader responses to "Be thankful for the present amid planning the future". Good thoughts to ponder on a day like today. Have a truly thankful thanksgiving! Important reflections on appreciating the present — thank you for the thoughtful article. Happy Thanksgiving, everyone! I wish their was a cure for instant gratification, too many of my family members suffer from it! Have a Happy Thanksgiving! This is great! I have similar issues of being so fixed on the medium-term that I don’t give myself space to enjoy the present…although sometimes that just results in careening back into spending too much in the present to compensate. I hope your Thanksgiving is lovely! Very thoughtful article for Thanksgiving! Thank you!! I, too, have problems living in the moment. It’s easy to get caught in in an exciting future and not live in the moment. I’m trying to work on that….but since I am a natural planner and overthinker it’s hard! If your computer is on its last leg, maybe we should take a look at it together to check it’s really dying and not something fixable. I guess it’s the frugal thing to do! You reminded me Western culture can be so goal-oriented that we lose sight of living and enjoying!!!! Letting go of minor things and learning to accept now – always – is a mastery unto itself. This was a great read. Time spent worrying and fretting almost seems like it costs double non-worrying time. Not only is the time gone, but it also tends to leave you exhausted and with little patience for the rest of life. Hope you’re having a wonderful Thanksgiving and enjoying BOTH of the lovely families that you have in your life. Thanks for the kind words. Hope everyone had a wonderful Thanksgiving! Thanks! And– great article! YES to living in the moment (not FOR the moment– that’s different– hm, there’s an idea for my next article). Would have read/posted much much sooner but had to run the kitchen all day. Anyway not sure how old yr puter but you could (in theory) swap the HD for an SSD and increase RAM. SSD = FAST. But it all depends on so many things– just throwing the idea out there. Such a great post for us who r constantly planning for the future often i think, if i can just get this much saved then my life is set and i can start enjoying it. But then i think im wasting the time right now inshould be enjoying more. Great post really resonated with me. Drink up! Thanks for reading, and thanks for the computer advice…definitely something to consider…I’ll have to look into it. Cheers! As a nurse for the past 18 years, I have worked with many people who made it their life mission to save for their magical retirement. They saved and scrimped and denied themselves everything so that they could retire in comfort and, finally, be able to enjoy life. Unfortunately, folks, we are not guaranteed one day more on this earth. I have seen many of these people become sick (or die)shortly after retirement and be unable to enjoy any of their hard-earned savings! I’m not saying that we should live irresponsibly and save nothing for retirement, but it has to be balanced by living in the present. Don’t wait to start your bucket list. Start it now! “Our brain spends 70 percent of its time either thinking about the past or daydreaming about something that hasn’t happened” – I am guilty of doing this quite often. One trick that has helped me alleviate this problem is just writing down my thoughts and enumerating the concerns + action plan for the future and also stuff about the past I wish I could have done differently. The simple process of putting it down on paper helps me to stop mulling over it 24/7. It gives a concrete structure to my abstract thoughts. And that stops the rewind and replay mode. Great post and happy thanksgiving! I think this may be my favorite article on GRS, at least my fave not written by JD. It spoke to me on a ton of levels. 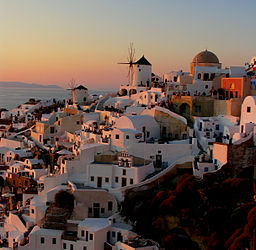 I love Santorini, its my fave place on earth. I definitely made sure I enjoyed and savored every minute I was there (having cocktails on a terrace overlooking the sea was amazing). This past week, I broke down and bought an executive first class ticket to Australia for February and a piece of original art that I’ve wanted for years from my favorite artist. Rather than save save save, I’ve opened up and spent on me. And it feels good. I’m still going to put away money each month and stay out of debt, but YOLO! I make enough money to balance saving and spending. Thanks for this post Kristin. It was brilliant. Fantastic post! This is pretty much my dilemna every day. How much planning for a retirement we might never enjoy is enough? How about planning for various worst case scenarios? Should we really spend our life in a place we hate, because of the immense financial difficulty of changing location? How can I live more in the moment and actually enjoy it, as opposed to resenting where and how we currently live? I realize that even having the luxury of asking these existential questions makes me incredibly spoiled and lucky.